Does Total Fiber Intake Matter More Than The Fiber Source? Focus on total fiber, not the source. Soluble. Insoluble. Viscous. Fermentable. Fiber’s many forms can confuse the most ardent health nut and even nutrition professionals debate the precise benefits of each type. Thankfully, then, a series of recent studies have lifted one clear message above the noise: Don’t fret the categories, but focus on total fiber; getting lots of it from unprocessed plants will lower your risk of health problems well into your golden years. That message has been taken to task by a French study. When researchers examining close to 6,000 people associated fiber intake with high blood pressure, cholesterol and other risk factors for cardiovascular disease, they came up with a complex latticework of benefits by type and source of fiber. For example, fiber from cereals was linked to lower body mass index and blood pressure while fiber from dried fruit and nuts was associated with a lower waist-to-hip ratio. Observational studies on cardiovascular disease support Lupton’s claim. The massive Nurses’ Health Study and Health Professionals Follow-up Study, among others, found that adults who consumed the most total fiber, near the recommended 25 grams per day for women and 38 grams for men (double what typical Americans consume) are much less likely to suffer heart problems. “Collectively, it’s about a 30 percent risk reduction in heart disease,” Lupton says. The big disappointment, however, is that current research has found no connection between fiber and colorectal cancer. That news undercuts the safety net of many people with a family history of colon cancer since doctors, depending upon intuition and encouraging animal studies, have long recommended high-fiber diets. Still, there may be some as-yet-unknown factor in fiber that produces a positive effect, says John Baron, an epidemiologist at Dartmouth Medical School. Lupton says the data are stronger for type 2 diabetes, since a high-fiber diet has been linked to lower risk in several major studies. Other research shows that eating fiber may help prevent obesity and, of course, constipation. In the end, many experts believe total fiber may really just be a proxy for healthy eating habits. “My feeling is that fiber itself has an effect, but other things—known or not—in healthy foods are also important,” says Denis Lairon, the researcher who conducted the French study. Some fibers may prove better than others in the case of two specific health conditions. To combat sky-scrapingly high “bad” cholesterol levels, Mark G., a psychologist who lives just outside of Boston, makes a bowl of oatmeal every morning using 3/4 cup old-fashioned oats. This provides 3 grams soluble fiber, the type that binds LDL “bad” cholesterol and prevents it from wreaking havoc in his blood vessels. Along with regular exercise and some weight loss, Mark’s morning “medicine bowl” (a suggestion from his physician) has lowered his cholesterol by 40 points. 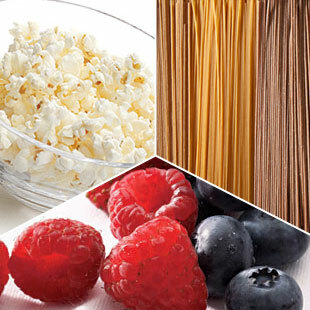 Good choices of soluble fiber: barley, oatmeal, beans, peas, citrus fruits, pears, apples, strawberries and eggplant. Insoluble fiber, which absorbs water and increases in bulk, helps move food through the gastrointestinal tract, helping prevent constipation. Good choices of insoluble fiber: most whole grains, such as whole-wheat bread and wheat bran, cabbage, beets, bananas, carrots, tomatoes and Brussels sprouts. Bottom Line: Eating 25 grams of fiber per day (for women) or 38 grams (for men) seems daunting—until you make it a habit.